Beyers, J and S. Arras (2019) Who feeds information to regulators? Stakeholder diversity in European Union regulatory agency consultations Journal of Public Policy in press. De Bruycker, I. and J. Beyers (2018) Lobbying Strategies and Success. Inside and Outside Lobbying in European Union Legislative Politics European Political Science Review doi: 10.1017/S1755773918000218. Heylen, F., B. Fraussen, and J. Beyers (2018) Live to Fight Another Day? Organizational Maintenance and Mortality Anxiety of Civil Society Organizations Nonprofit and Voluntary Sector Quarterly 47(6) : 1249-1270. Wonka, A., I. De Bruycker, D. De Bièvre, C. Braun, and J. Beyers (2018) The scope of mobilization and patterns of conflict in EU interest group politics Politics and Governance 6(3): DOI: 10.17645. Beyers, J. and I. De Bruycker (2018) Lobbying makes (strange) bedfellows. Explaining the formation and composition of lobbying coalitions in EU legislative politics Political Studies 66(4): 959-984. Beyers, J., A. Dür and A. Wonka (2018) The Political Salience of EU Policies Journal of European Public Policy 25(11): 1726-1737. Van Hecke, M., P. Bursens and J. Beyers (2016) You’ll never lobby alone. Explaining the participation of sub-national authorities in the European Commission’s open consultations Journal of Common Market Studies 54(6): 1433-1448. Hanegraaff, M., J. Beyers, and I. De Bruycker (2016) Balancing Inside and Outside Lobbying: The Political Strategies of Lobbyists at Global Diplomatic Conferences European Journal of Political Research 55(3): 568-588. De Bièvre, D., A. Poletti, M. Hanegraaff and J. Beyers (2016) International institutions and interest mobilization: The WTO and lobbying in EU and US trade policy Journal of World Trade 50(2): 289–312. Fraussen, B. and J. Beyers (2016) Who’s In and Who’s Out? Explaining Access to Policymakers in Belgium Acta Politica 51(2): 214-236. Klüver, H., J. Beyers, and C. Braun (2015) Legislative lobbying in context. Towards a conceptual framework of interest group lobbying in the European Union Journal of European Public Policy 22(4): 447-61. Beyers, J., I. De Bruycker, and I. Baller (2015) The alignment of parties and interest groups in EU legislative politics. A tale of two different worlds? Journal of European Public Policy 22(4): 534-51. De Bruycker, I. and J. Beyers (2015). Balanced or Biased? Interest Groups and Legislative Lobbying in the European News Media. Political Communication 32(3): 453-474. Hanegraaff, M., C. Braun, D. De Bièvre and J. Beyers (2015) The domestic and global origins of transnational interest communities. Explaining lobbying patterns during WTO Ministerial Conferences, 1995-2011 Comparative Political Studies 48(12): 1591-621. Beyers, J., T. Donas and B. Fraussen (2015) No Place Like Home? Explaining Venue Selection of Regional Offices in Brussels. Journal of European Public Policy 22(5): 589-608. Beyers, J. and T. Donas (2014) Inter-Regional Networks in Brussels. Analyzing the Information Exchanges among Regional Offices European Union Politics 15(4): 547-71. Beyers J, L.C. Bonafont, A. Dür, R. Eising, D. Fink-Hafner, D. Lowery, W. Maloney, and D. Naurin (2014) The INTEREURO Project: Logic and Structure Interest Groups & Advocacy 3(2): 126–40. Beyers J, A. Dür, D. Marshall and A. Wonka (2014) Policy-centred sampling in interest group research: Lessons from the INTEREURO project Interest Groups & Advocacy 3(2): 160–73. Beyers J, C. Braun, D. Marshall and I. De Bruycker (2014) Let’s Talk! On the practice and method of interviewing policy experts Interest Groups & Advocacy 3(2): 174–87. Beyers J., P. Bursens and T. Donas (2014) Domestic coordination and mobilization in three EU member states. Looking beyond the formal mechanisms. Regional and Federal Studies 24(3): 363-81. Donas T., B. Fraussen and J. Beyers (2014) It’s Not All About The Money. Explaining Varying Policy Portfolios of Regional Representations in Brussels. Interest Groups & Advocacy 3(1): 79–98. Fraussen B., J. Beyers and T. Donas (2014) The Expanding Core and Varying Degrees of Insiderness. Institutionalized Interest Group Involvement Through Advisory Councils. Political Studies 63(3): 569–88. Beyers J. and P. Bursens (2013) How Europe shapes the nature of the Belgian Federation. Differentiated EU impact triggers both cooperation and decentralization. Regional and Federal Studies, 23(3): 271-91. Donas T. and J. Beyers (2013) How Regions Assemble in Brussels: The Organizational Form of Territorial Representation in the European Union. Publius 43(4): 527-50. Beyers J. and B. Kerremans (2012) Domestic embeddedness and the dynamics of multi-level venue-shopping in four EU member-states. Governance 25(2): 263-90. Hanegraaff M., J. Beyers, and C. Braun (2011) Open the door to more of the same? The development of interest group representation at the WTO. World Trade Review 10(4): 447-72. Beyers J. (2011) Politieke wetenschap als beroep : over het spanningsveld tussen maatschappelijke relevantie en academische ernst. Res Publica 53(1): 106-12. Beyers J., (2010) Conceptual and methodological challenges in the study of European socialization. Journal of European Public Policy 17(6): 909-20. Beyers J. (2009) De ondraaglijke traagheid van het academisch bestaan. Res Publica 51(4): 542-7. Beyers J., R. Eising and W.A. Maloney (2008) Conclusion: Embedding Interest Group Research. West European Politics 31(6): 1290-300. Beyers J. 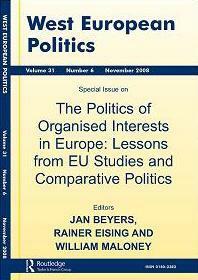 (2008) Policy Issues, Organisational Format and the Political Strategies of Interest Organisations. West European Politics 31(6): 1188-211. Beyers J., R. Eising and W.A. Maloney (2008) Researching Interest Group Politics in Europe and Elsewhere: Much We Study, Little We Know? West European Politics 31(6): 1103-28. Beyers J. (2008) Waarom delen met zo velen? De spanning tussen de uitbreiding en de verdieping van de Europese Unie. Res Publica 50(2): 193-206. Beyers J. and B. Kerremans (2007) Critical Resource Dependencies and the Europeanization of Domestic Interest Groups. Journal of European Public Policy 14(3): 460-81. Beyers J. and B. Kerremans (2007) The Press Coverage of Trade Issues. A Comparative Analysis of Public Agenda-Setting and Trade Politics. Journal of European Public Policy 14(2): 269-92. Beyers J. and P. Bursens (2006) The European Rescue of the Federal State: How Europeanization shapes the Belgian state. West European Politics 29(5): 1057-78. Beyers J. (2005) Multiple Embeddedness and Socialization in Europe: The Case of Council Officials. International Organization 59(4): 899-936. Beyers J. and J. Trondal (2004) How Nation-States ‘hit’ Europe. Ambiguity and Representation in the European Union. West European Politics 27(5): 919-42. Beyers J. and B. Kerremans (2004) Bureaucrats, Politicians, and Societal Interests. How is European policy-making politicized? Comparative Political Studies 37(10): 1-31. Beyers J., T. Delreux and C. Steensels, C. (2004). The Europeanisation of intergovernmental cooperation and conflict resolution in Belgium: The case of agriculture. Beyers J. (2004) Voice and access: Political practices of European interest associations. European Union Politics 5(2): 211-40. Beyers J. (2002) Gaining and seeking access: The European adaptation of domestic interest associations. European Journal of Political Research 41(5): 585-612. Beyers J. and B. Kerremans (2000) Multi-Level Governance en de toegang tot de Europese beleidssettings. Een onderzoek naar de manier waarop de “multi-level” de “governance” beïnvloedt. Res Publica 43(1): 103-26. Dierickx G. and J. Beyers (1999) Belgian Civil Servants in the European Union. A tale of two cultures. West European Politics 22(3): 198-222. Beyers J., (1998) Permissieve consensus, maatschappelijk debat en het draagvlak van de Europese Unie bij de Belgische maatschappelijke organisaties. Res Publica 40(2): 247-72. Beyers J. (1998) How supranational is supranationalism? National and European socialization of negotiators in the Council of Ministers. Acta Politica 33(4): 378-408. Beyers J. (1997) De verhouding tussen politiek en bestuur in het Belgisch Europees Beleid, Res Publica 39(3): 399-422. Beyers J. and G. Dierickx (1997) Nationality and European Negotiations. The Working Groups of the Council of Ministers. European Journal of International Relations 3(4): 435-71. Kerremans B. and J. Beyers (1995) De plaats van de federale overheid, gewesten en gemeenschappen in de Europese Unie: consequenties van de staatshervorming en de wijziging van artikel 146 EU. Tijdschrift voor Bestuurskunde en Publiek Recht 50(11): 647-57. Beyers J. & Kerremans, B. (1994) Relativi­teit en Succes van een Europees Voorzit­terschap. Het Belgisch Voorzitterschap van Naderbij Bekeken. Res Publica 36(2): 129-41. Beyers J. (1994) De Structuur van Besluitvorming in de Raad van Ministers van de Europese Unie. Res Publica 36(3/4): 381-98. Beyers, J. and P. Bursens (2006). Europa is geen buitenland. Over de relatie tussen het federale België en de Europese Unie. Leuven: Acco. Vollaard H., J. Beyers and P. Dumont (2015). European Integration and Consensus Politics in the Low Countries. London: Routledge. Beyers, J., R. Eising and W.A. Maloney (2010). Interest group politics in Europe. New York: Routledge. Beyers, J. and M. Hanegraaff (2015) Towards a Population Ecology Approach to Trans-National Advocacy? An Emerging Research Field. The Organizational Ecology of Interest Communities Reconsidered. D. Lowery, D. Halpin and V. Gray (editors). New York, Palgrave (in print). Beyers J., C. Braun and M. Haverland (2015) Plus ça change, plus c’est pareil: European integration and interest group politics in the Low Countries. In H. Vollaard, J. Beyers and P. Dumont (Eds.) 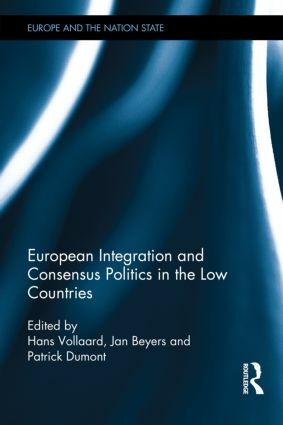 European Integration and Consensus Politics in the Low Countries, (pp. 134-154) London: Routledge. Beyers J., H. Vollaard and P. Dumont (2015) Introduction. European integration and consensus politics. In H. Vollaard, J. Beyers and P. Dumont (Eds.) 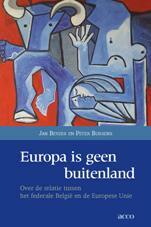 European Integration and Consensus Politics in the Low Countries, (pp. 1-23) London: Routledge. Beyers J. and P. Bursens (2013) Over samenwerkingsfederalisme en streven naar autonomie: of hoe de Europese Unie de Belgische federatie vormgeeft. In E. Vandenbossche and S. Van Drooghenbroeck (Eds.) Europese voorschriften en staatshervorming, (pp. 111-138) Brugge: Die Keure. Hanegraaff M., J. Beyers, and C. Braun (2012) Mapping the WTO interest group system : exploring density, diversity, and stability over time. In D.R. Halpin and G. Jordan (Eds.) The scale of interest organization in democratic politics: data and research methods, (pp. 180-201) New York: Palgrave. Beyers J. and P. Bursens (2011) Towards a multilevel welfare state? On the relative autonomy of regional social policy. In B. Cantillon, N. Mussche and P. Popelier (Eds.) Social federalism: the creation of a layered welfare state: the Belgian case, (pp. 45-66) Oxford: Intersentia. Beyers J. and P. Bursens (2010) Naar een gelaagde welvaartsstaat? Over de relatieve autonomie van regionaal sociaal beleid? In B. Cantillon, N. Mussche and P. Popelier (Eds.) De gelaagde welvaartsstaat: naar een Vlaamse sociale bescherming in België en Europa? (pp. 49-60) Antwerpen: Intersentia, 2010. Beyers J. (2010) Problèmes conceptuels et méthodologiques dans la recherche sur la socialisation internationale. In H. Michel et C. Robert (Eds.) La fabrique des “européen” processus de socialisation et construction européenne, (pp. 29-63) Strasbourg: Presses universitaires de Strasbourg. Beyers J. and P. Bursens (2009) The European rescue of the federal state. In M. Brans, L. Dewinter Lieven and W. Swenden (Eds.) The politics of Belgium, (pp. 195-216) London: Routledge. Beyers J. and B. Kerremans (2007) Critical Resource Dependencies and the Europeanization of Domestic Interest Groups. In D. Coen (Ed.) EU Lobbying: Empirical and Theoretical Studies, (pp. 128-49) London: Routledge. Beyers J. (2006) Political Cleavages and Interest Group Politics. A Comparative Analysis. In P. Bursens and P. Thijssen (Eds.) Zoon Politikon. Tussen effectiviteit en legitimiteit Liber Amicorum voor Professor Guido Dierickx. (pp. 101-30) Brugge: Vanden Broele. Beyers J. and B. Kerremans (2005) Bürokraten, Politiker und gesellschaftliche Interessen: Ist die Europäische Union entpolitisiert? In R. Eising and B. Kohler-Koch (Eds.) Interessendurchsetzung im europäischen Mehrebenensystem, (pp. 123-50) Baden-Baden: Nomos. Beyers J., T. Delreux and C. Steensels (2004) The Europeanisation of Intergovernmental Co-operation and Conflict Resolution in Belgium: The Case of Agriculture. In A. K. Bourne (Ed.) The EU and territorial politics within the member states: conflict or co-operation, (pp. 19-50) Leiden: Koninklijke Brill. Hosli M.O., A. Nölke and J. Beyers (2004) Contending Political-Economy Perspectives on European Interest Group Activity. In A. Warntjen and A. Wonka (Eds.) Governance: The Role of Interest Groups, (pp. 42-56) Baden-Baden: Nomos. Beyers J. (2002) ‘Het grootste gevaar is dat er niet meer gebaggerd wordt’: over de theorie van de rechtvaardige oorlog en de campagne tegen het international terrorisme. In B. Pattyn and J. Wouters (Eds.) Schokgolven. Terrorism en Fundamentalisme en 11 september, (pp. 168-81) Leuven: Davidsfonds. Kerremans B. and J. Beyers (2001) Diverging images of consensus, Belgium and its view on European Integration. In K. Goldmann and K. Gilland (eds. ), Nationality versus Europeanisation: The National View of the Nation in Four EU Countries. (pp. 126-65) Stockholm: Department of Political Science. Bursens P., J. Beyers and B. Kerremans (2001) European Policy Preparation and Implementation in the Three Benelux Member-states. In E.E. Zeff and E.B. Piro (Eds.) Policy-Making in the European Union: The Member States, (pp. 59-88) Boulder: Lynne Riener Publishers. Beyers J. (1999) Fragmentation des Politiques Européennes et Culture Administrative en Belgique. In Y. Lejeune (Ed.) La Participation de la Belgique à l’Elaboration et à la Mise en Oeuvre du Droit Européen, (pp. 503-5) Brussel: Bruylant. Beyers J. (1999) Where Does Supra-Nationalism Come From? The Ideas Floating Through the Working Groups of the Council of the European Union. In F. Columbus (Ed. ), Central and Eastern Europe in Transition, Vol. III (pp. 255-87) New York: Nova Science Publishers. Bursens P., J. Beyers and B. Kerremans (1998) The Environment Policy Review Group and the General Consultative Forum. In M.P.C.M. Van Schendelen (Ed. ), EU Committees as Influential Policymakers. (pp. 25-46) Aldershot: Ashgate. Kerremans B. and J. Beyers (1998) Belgium : The Dilemma between Autonomy and Cohesion. In K. Hanf and B. Soetendorp (eds. ), Adapting to European Integration. Small States and EU-Membership. (pp. 14-35) Harlow: Longman. Kerremans B. and J. Beyers (1997) The Belgian Subnational Entities in the European Union : ‘Second’ or ‘Third Level’ Players?. In C. Jeffrey (ed. ), The Regional Dimension of the European Union. Towards a Third Level in Europe ? (pp. 41-55) London : Frank Cass Publ. Beyers J. and B. Kerremans (2006) Critical Resource Dependencies and the Europeanization of Domestic Interest Groups. SPP Working Paper Series, Working Paper 20, http://www.ucl.ac.uk/spp/publications/wps.php.